When I was in pre-calculus, there was a 10-Day Pre-Cal syllabus. One of the days was, “Show them the video of the student factoring x^2 + y^2 = (x+y)^2 and getting HIT BY A TRAIN” so that made me laugh a lot! Oh, I just saw Jim Vaught’s comment. He already got the commutative ring of characteristic 2. Foiled again. We call this the freshman dream. It works for boolean algebra too, though admittedly I’ve never seen exponents used to represent iterated AND gates. That would be a seriously cute notational convention. I’m a math tutor at a college campus…I’m definitely going to hang this up in the room. Printed out very large. Doesn’t every equation work in Z_1? (x + y)^2 = x^2 + y^2 is valid if xy + yx = 0. Sorry if this is a silly question, but shouldn’t it be foils powers, rather than foils products? 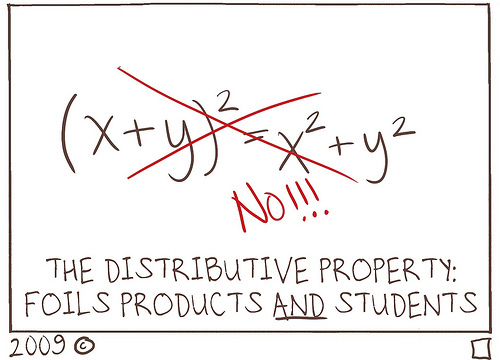 Of course a power just indicates products, but the distributive rule works for products by one term.